This "infusion", from the set of Beauty Infusions that Skin Authority has come out with, is a wonderful way to brighten skin without using any Vitamin C or AHAs. 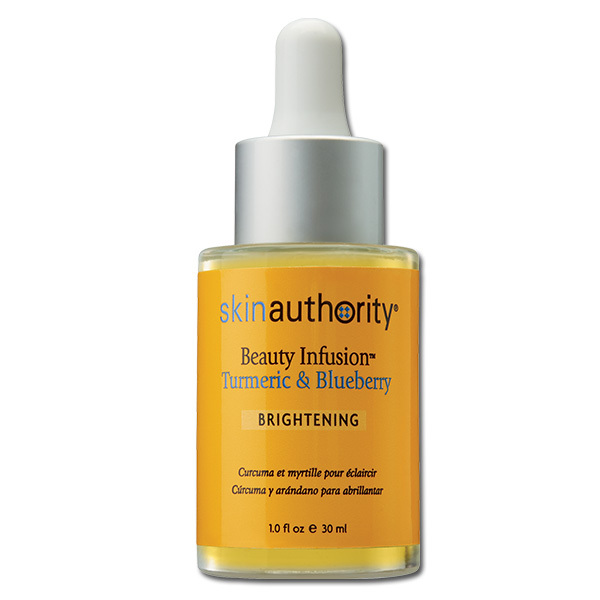 It concentrates the power of curcumin found in turmeric and the antioxidants found in blueberries to help fade the appearance of dark spots and discolorations. Turmeric has been used for centuries to make skin look spotless and radiant. You can either use it directly on your skin at night, during the day underneath your sunscreen or add a few drops to your favorite foundation or skincare product, or apply directly on your skin as a standalone skin primer. Personally, I prefer to apply it at night underneath my serums and moisturizers. It is non-greasy and has a natural base oil blend that absorbs quickly into the skin. Turmeric and curcumin are active naturals to brighten and illuminate the complexion. It easily combines with most makeup foundations or skincare products. Can be applied directly on skin as a standalone primer. This infusion does not contain any dyes, fragrances, parabens, or has been subjected to animal testing. I think this infusion does a wonderful job of brightening the skin. I love how versatile the product is. The fact that you can use this on skin alone, as a primer/skincare product, in foundation or in another skincare product is great. Personally, I prefer to use it as a standalone product. It is oily but not greasy and sinks right into the skin, leaving no oily feeling behind. This way you get a nice light sheen to the skin like a primer would leave but without any oily residue. And it does brighten the skin. I used this for up to 4 weeks. It lightened my hyperpigmentation, especially around and under my eyes. It took about 3 weeks to 4 weeks to see results, it was not instantaneous. But I did see results and I am happy about that. And they were not pitiful either. I saw good results that I would say are about 5 on a scale of 1-10, with 10 being the best. 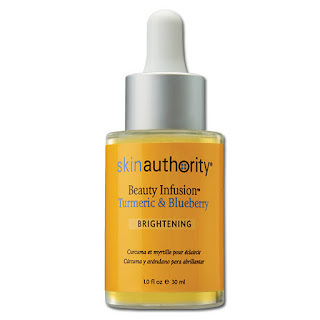 The Skin Authority Beauty Infusion Turmeric & Blueberry Brightening is available from www.skinauthority.com for $49.00. Like Skin Authority on Facebook: https://www.facebook.com/skinauthority; Follow Skin Authority on Twitter: @skinauthority; Follow Skin Authority on Pinterest: https://www.pinterest.com/skinauthority/; Follow Skin Authority on Instagram: https://www.instagram.com/skinauthority/ and Follow Skin Authority on YouTube: https://www.youtube.com/user/beautyworkout.